HIPAA and you! The Health care industry, especially Medical and Dental practices, have unique computer and networking needs that must be correctly integrated to provide a stable, secure and productive office network to best serve your patients. At Cycrest, we know how to customize and integrate these technologies, allowing you a secure, productive and stable practice. With a focus on longer term ROI (return on investments, meaning more money in your pocket), Cycrest works to install longer term solutions, meaning less computer upgrades over time and more stable and productive systems. 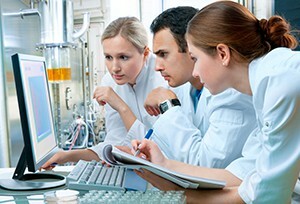 Cycrest personnel are trained to install and support advanced medical and dental software and computer systems. From capturing and storing digital Patient X-rays, Electronic Medical records (EMR) systems, and informational systems to patient education and tracking to implementing specific software systems, we have the expertise and experience to support a wide variety of applications to help increase your productivity….all with HIPAA compliance in mind. Cycrest works hard to help keep you HIPAA Compliant. With network monitoring and scanning, security updates and virus scans…Cycrest works hard to audit your systems on a consistent basis, providing you the documentation you need when it’s time for your HIPAA audit. Just ask us for details.